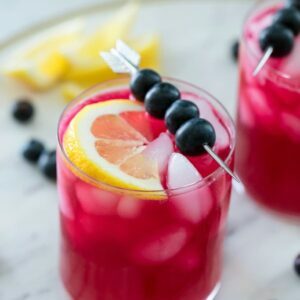 Before you stop and think this recipe is really crazy, just hear me out for a second. It’s well…. well, OK it’s a little crazy. But before you start judging and thinking I must be crazy, too, please just know that it totally works. It works almost a little toooo well. To the point where you definitely won’t want a platter of these hanging around your house. Or maybe you do. Because they’re delicious… And bite-sized. Also, sprinkles. 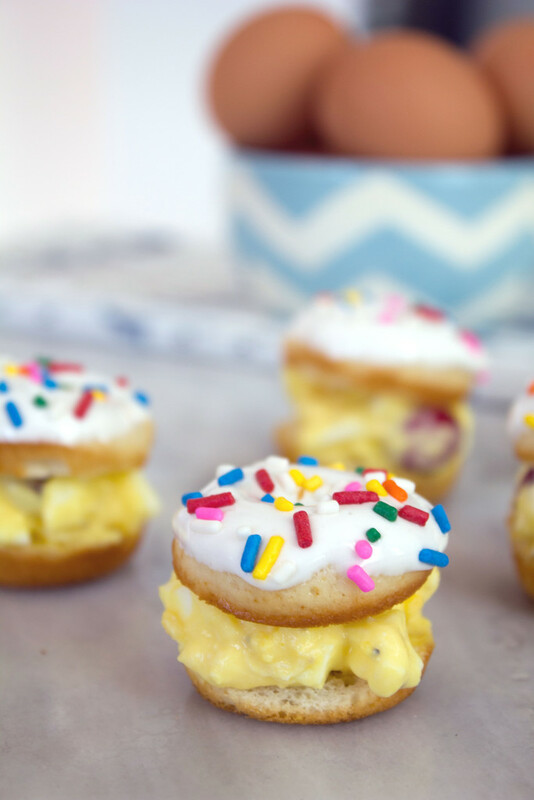 These Mini Egg Salad Doughnut Sandwiches were born out of my constant need to go overboard. I’m currently working with Eggland’s Best to let you know about their 2016 America’s Best Recipe Contest. The whole idea of the contest is to create a recipe that utilizes both Eggland’s Best Eggs and a food that your home state is known for. While Massachusetts is certainly known for its share of foods, none of them were overly exciting to me when I was working on the recipe planning process. I kept thinking I really just wanted to make an egg sandwich with Dunkin’ Donuts (because if there’s one thing Massachusetts is known for, it’s Dunkin’ Donuts. There are, no joke, 8 in my town). But I also kept thinking about Fluff and how it was born in Somerville, MA. And cranberries because they are so Massachusetts. And suddenly, I had made an egg salad with Greek yogurt and cranberries and mini doughnuts with homemade fluff. It was like I had lost control and there was nothing I could do about it. 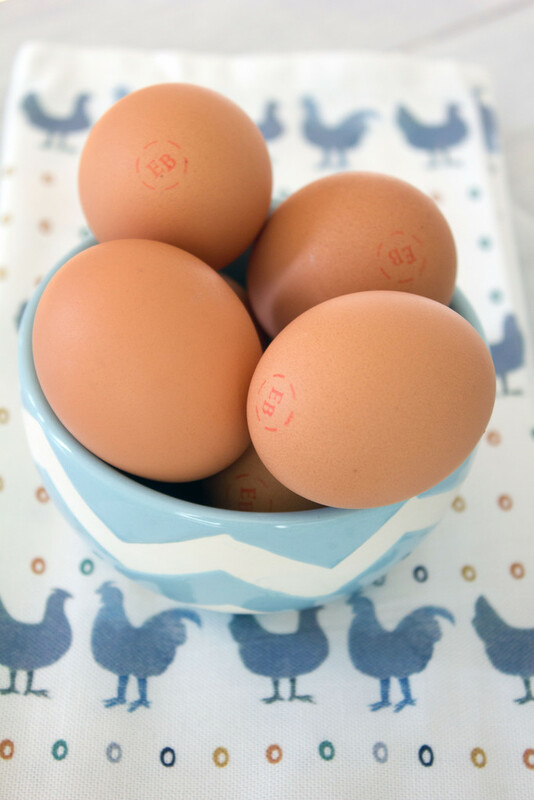 First, I have to tell you that I exclusively purchase Eggland’s Best eggs and have ever since I attended an event with them wayyy back in 2010 (it makes me sad how many of the lovely bloggers at the event are no longer blogging! My hair in 2010 also makes me very sad). I used to not care at all about what eggs I bought at the grocery store (though I always considered brown eggs best!) until I learned about Eggland’s Best. One reason (or really three) why I choose them is because each egg has five times more Vitamin D, more than double the omega-3s, and 25% less saturated fat. Eggs that are healthier than ordinary eggs? Sign me up. Also, I personally think they taste better and look prettier than other eggs. I generally have at least 2 dozen eggs in my fridge at all times and try to hard-boil a big batch of them every weekend. Egg salad is one of my favorite foods in all the world. The version I made for this recipe utilizes all Greek yogurt instead of mayo, since I figured that would be a better complement to doughnuts. I also added in some fresh cranberries, but you could use Craisins if you prefer a bit more sweet over tart. The mini doughnuts I made are super mini, using this pan and a simple recipe. Homemade fluff I actually make way too often for my own good because it’s ridiculously easy and always handy to have around. 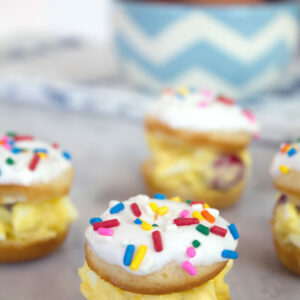 I cut each mini doughnut in half, put a dollop of egg salad on the bottom, dipped the top in fluff and sprinkles, and made little sandwiches. When I first told Chris my idea, I’m pretty sure he questioned why he had ever married me. But when he saw the finished product, he said they looked way better than he had imagined. And then he tried one and said they made for an amazing combination and were ridiculously delicious. See? Never question your wife. Especially when she cooks for you. I personally think these mini sandwiches would be great for a little cocktail party. Whether you put them on the appetizer table or the dessert table is up to you. One of the beautiful things about eggs is that they make for all kinds of different sweet and savory dishes. They don’t judge and neither should you. Also… while doing some research on my ideas, I came across a bunch of information from last summer about how marshmallow omelets are all the rage in Japan. Which clearly means the trend will be coming here soon. Whether or not you want it to. I just brought it. So, I recommend you get on board, too. You might still think I’m crazy and that’s OK. I’ve been called worse. If you think you can create a recipe that’s a little less crazy, I invite you to do so. You”ll have a chance to win $10,000 if you enter your recipe on the Eggland’s Best website by April 29! Eggland’s Best will also be awarding 4 regional winners $1,000, along with a year supply of Eggland’s Best eggs and 53 winners “Best in State” awards of a year supply of Eggland’s Best eggs. $10,000 would be fabulous, but I have to admit a year supply of Eggland’s Best eggs would suit me very well! 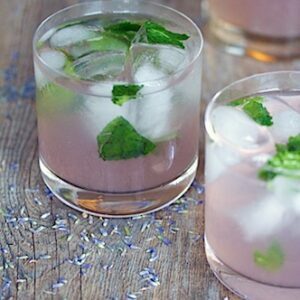 Want a little recipe creation head-start? I’m giving away a $25 gift card and coupon for a free carton of Eggland’s Best eggs, so you can get recipe testing. All you have to do is comment on this post by Tuesday, April 5 at 11:59 p.m., letting me know your favorite way to eat eggs. 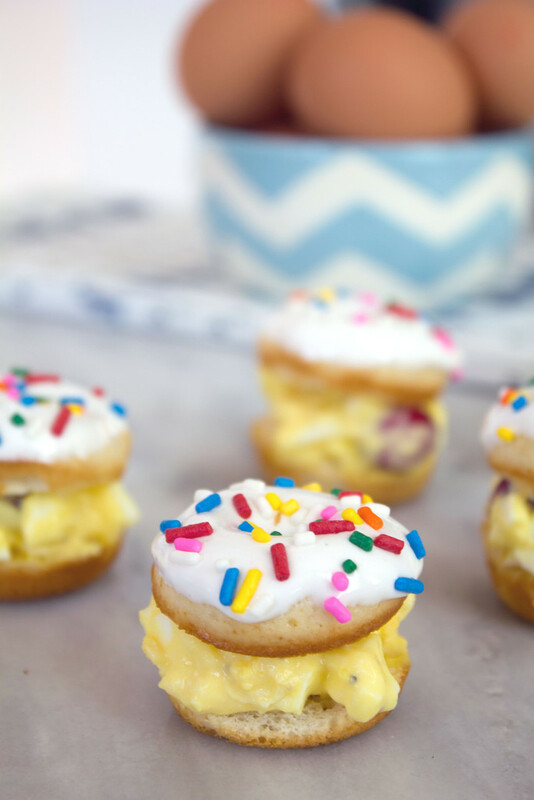 These Mini Egg Salad Doughnut Sandwiches may sound a little crazy, but they'll make for the perfect savory and sweet appetizer or dessert at your next cocktail party! Chop hardboiled eggs and place in a medium-sized bowl. Mix in Greek yogurt, cranberries or Craisins, and salt and pepper. Keep stored in airtight container in fridge. In large bowl, whisk together flour, sugar, baking powder, and salt. Stir in milk, melted coconut oil, and vanilla until just combined. 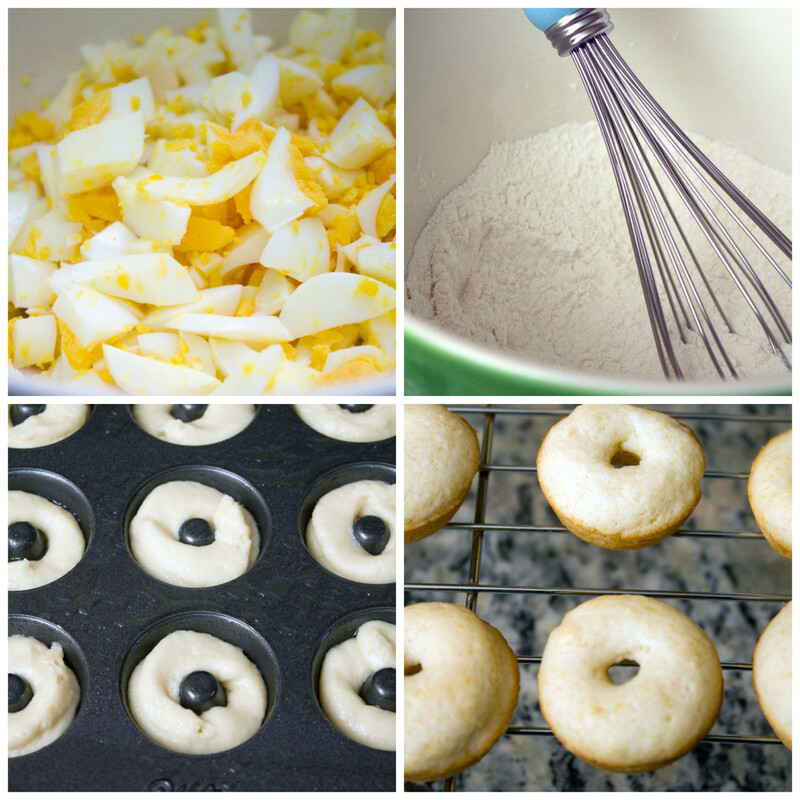 Fill cavities of a mini doughnut pan about ¾ the way full. Bake for 7-9 minutes, until doughnuts are just starting to turn golden at edges. Let doughnuts cool in pan for a few minutes before moving to wire rack to cool completely. 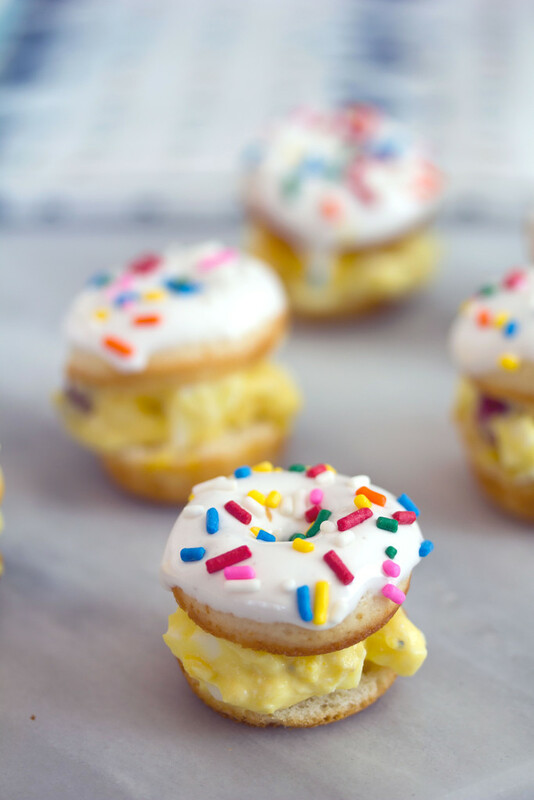 Once doughnuts are cool, dip half of them facedown in homemade fluff and add sprinkles on top. In the bowl of a stand mixer beat together egg white, corn syrup, and salt on high speed for 4-5 minutes until it thickens up and turns white. Mix in the powdered sugar, cream of tartar, and vanilla on low speed, until combined. Store extra fluff in an airtight container in fridge. Spoon a small scoop of egg salad on top of un-dipped mini doughnuts and top with a fluff-dipped sprinkles-topped doughnut. 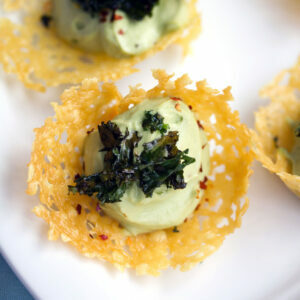 Serve for brunch, an appetizer, or dessert! 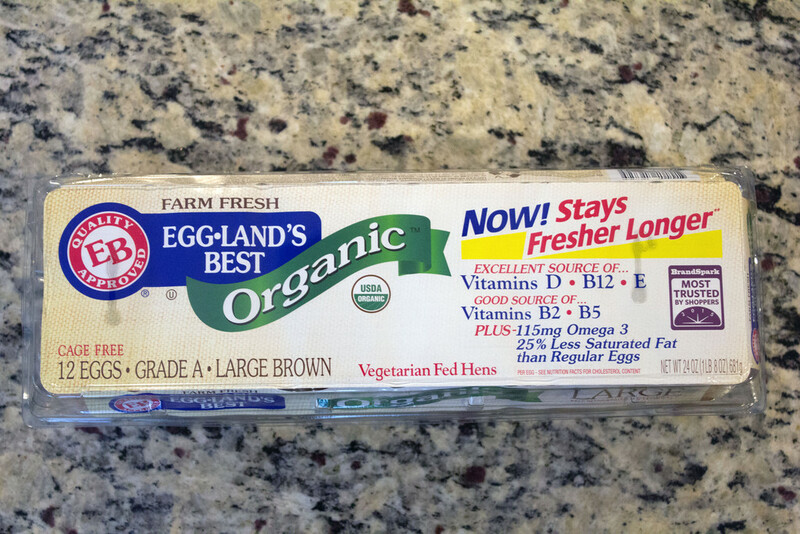 Thank you so much to Eggland’s Best for sponsoring this post. Though this is a sponsored post, all opinions are 100% my own and I only work with brands that I truly believe in and love. 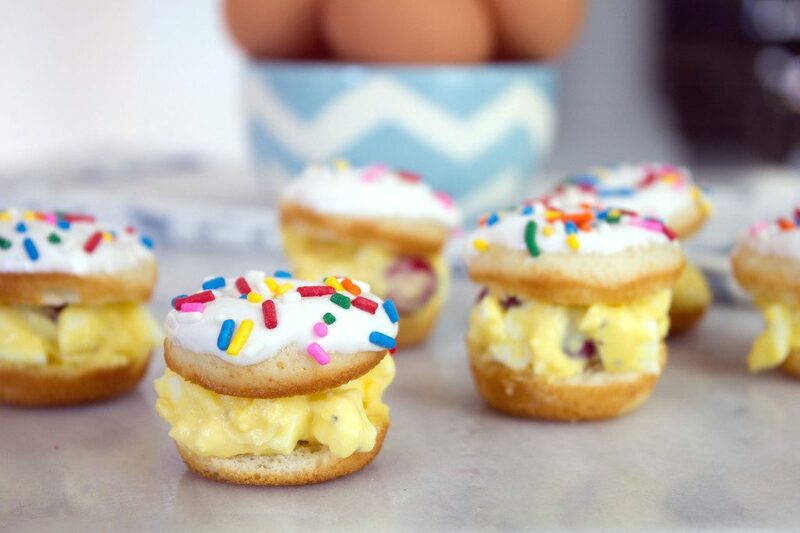 12 Responses to "Mini Egg Salad Doughnut Sandwiches"
Two eggs poached on toast! That was my breakfast for years growing up. Thank you mom for mastering the poached egg! I love to eat an cheese omelette topped with sour cream and chili! My absolute favorite. 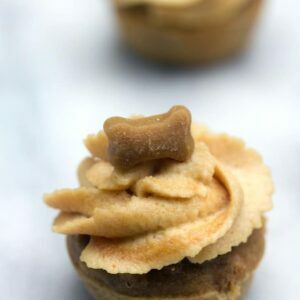 Your recipe is so creative & delicious looking. They would present beautifully on any table! I always buy Egglands Best eggs.. I like them cooked all kinds of ways but my favorite way is perfectly poached! What a delicious combination of sweet and savory and a great way to use leftovers! I’d definitely try these since i love the sweet/salty combo! I usually eat my eggs scrambled! I love a good fried egg sandwich. Oh we love to make omelets with our eggs! My favorite is being able to pick fresh vegetables from our container garden to put in them!